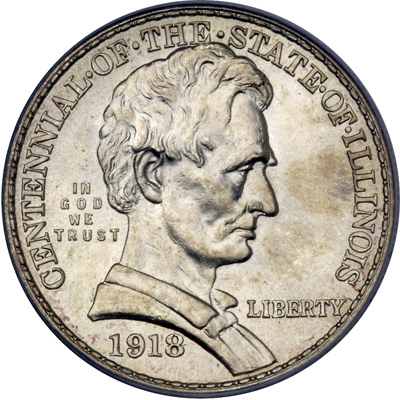 In 1918, the state of Illinois looked to honor their centennial year with the issuance of a coin. As opposed to many other commemorative issues in the classic commemorative series, the funds raised were actually used for their intended purpose, which was to help fund the centennial celebrations in the state. 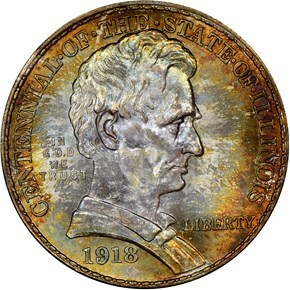 The legislation which authorized the coin was passed on June 1st, 1918 and called for the coining of not more than 100,000 half dollars in honor of the state’s centennial. As the centennial year was already nearly half over, the design of the coin had to be completed quickly. Therefore, there were two designers; one to design the obverse, and the other for the reverse. 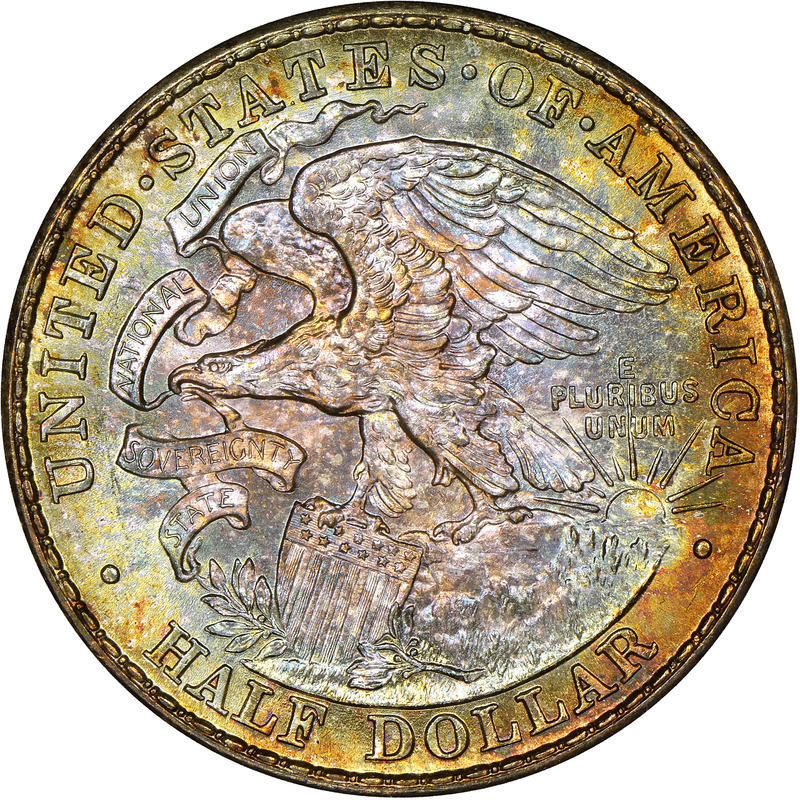 Mint Chief Engraver George T. Morgan (of Morgan dollar fame) sculpted the obverse, while his newly-hired assistant John R. Sinnock completed the reverse. The obverse depicts a masterfully completed portrait of a young Abraham Lincoln (who spent his formative and early adult years in the state.) On the periphery of the obverse is CENTENNIAL OF THE STATE OF ILLIONOIS. Behind Lincoln’s head is the motto IN GOD WE TRUST and to his right LIBERTY is found. Finally, the date 1918 is seen below. The reverse of the coin was just as beautifully rendered. It’s a slightly altered state seal of Illinois; a defiant eagle is perched upon a rocky mound and the federal shield, clutching in its beak a banner inscribed with the Illinois motto STATE SOVEREIGNTY NATIONAL UNION. A rising sun is at right, while an olive branch passes behind the shield. 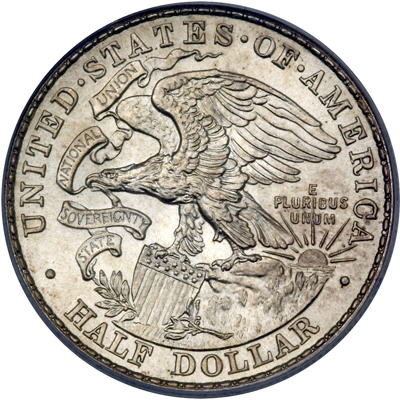 UNITED STATES OF AMERICA and HALF DOLLAR are arranged peripherally around the reverse. The motto E PLURIBUS UNUM appears above the sun in small letters to complete the design. All 100,000 of the coins authorized were coined, and about 70,000 were distributed during the centennial year. However, even with those strong sales, at least 30,000 coins remained, as that number was discovered in just one Illinois bank during Franklin D. Roosevelt’s Bank Holiday of 1933. 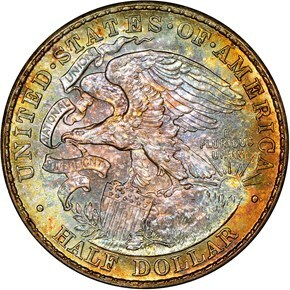 Most of those halves were sold to dealers at a small premium over face value, while the remaining coins placed into circulation. Therefore, the net mintage of this coin is the full authorized mintage of 100,000 coins.